Stoddart features a high-performance range of stainless steel urinal grates and complete systems. The Australian-owned and operated company continues to establish a strong presence as custom metalwork specialists in the building and construction industry, as well as the food service industry. Formerly known as Eureka Stadium, Mars Stadium is a premier oval shaped outdoor sports stadium situated in the Ballarat Showgrounds at Wendouree, an outer suburb of Ballarat in Victoria. In June 2015, the Victorian government announced the Ballarat Major Events Precinct Master Plan - a $38.5 million upgrade to the stadium and the wider Ballarat Major Precinct. The redevelopment is strategically taking place in three stages, with stage one of construction works recently completed in late 2017. Stoddart was among the elite construction companies recruited for the first stage of the Ballarat Major Events Precinct Master Plan. The Queensland-based company proudly fabricated and supplied a number of hinged urinals with stainless steel urinal grates for Mars Stadium. The Stoddart Grated Urinal is known as the most hygienic and effective urinal. It is precision designed to resist vandalism and corrosion for long lasting performance. The stainless steel build of the grates ensures dimensional stability and resilience to premature deterioration and hard, long term wear. Stainless steel is also widely used for its excellent hygienic properties. In addition, its sleek aesthetic provides a contemporary finish to the urinal grates. The Stoddart Grated Urinal has full depth sides to further improve hygiene. It has a vandal resistant sparge, which wraps around onto the side walls for a concealed profile. The sparge ensures proper wash with each flush to maintain cleanliness. Maximum water efficiency is achieved with a fall to waste of 1:80, as well as internal corners with a large radius. For easy installation, the Stoddart Grated Urinal is fully supported on legs. The void under the trough need not be filled with slurry to begin application. The unit can be set into the floor, with the top grate in a flush finish for a recessed look. It can also be set on the floor, fitted with an optional stainless steel front kick panel. Freestanding end panels are also available upon request. The first stage of the Mars Stadium redevelopment was completed at a cost of $15 million. Mars Stadium has already hosted its first Australian Football League (AFL) match last August. 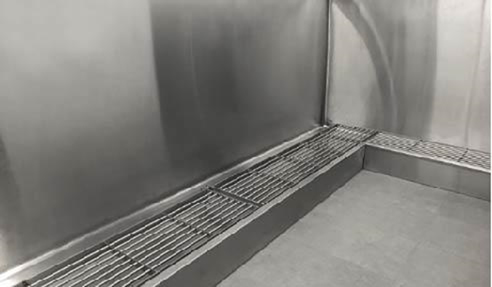 Get in touch with Stoddart at www.stoddart.com.au to learn more about stainless steel urinal grates and complete systems.